On June 4, 2018, Nick Chubb signed a four-year rookie deal worth about $7.4 million. On November 11, 2018, Chubb broke off a 92-yard rushing touchdown to help them secure a 28-16 victory over the Atlanta Falcons. Chubb's run was the longest rushing touchdown in Cleveland Browns franchise history. 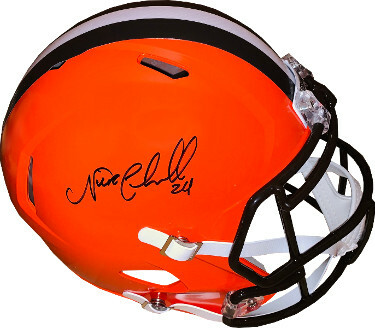 Nick Chubb has hand signed this Cleveland Browns Full Size Speed Rep Helmet #24. Photo of the Signing, JSA Witnessed Hologram and Certificate of Authenticity.